22" x 29" oil on artist board. Signed lower left. Newly framed in gold leaf frame with reeded edge. Andrew T. Schwartz was born in Louisville, Kentucky. His early education was in the public schools of his hometown, where he showed great promise as an artist. In 1890, he began intense art study with the famed Frank Duveneck at the Cincinnati ArtAcademy. He later studied with H. Siddons Mowbray at the Art Students League in New York, where he was awarded the Lazarus Scholarship for mural painting to study abroad, which resulted in three years of study in Italy, France, Germany and England. He was, at the time, only the second person to win that award. His work from the Lazarus trip was the subject of an individual show at the Pratt Institute in Brooklyn. He returned to the United States to assist his teacher Mowbray in decorating the University Club and J. P. Morgan’s private library in New York. He later worked independently and developed a following as a mural painter. His reputation was certainly enhanced by the mural Christ, the Good Shepherd for the Baptist Church in South Londonderry, Vermont, which was considered at the time one of the best examples of mural painting. Other murals were painted for the Courthouse of New York, the New York YMCA, the Atkins Museum of Fine Art in Kansas City and the Kansas City Life Insurance Company Building. Schwartz also painted a number of other paintings in addition to his murals, including both figurative and landscapes. 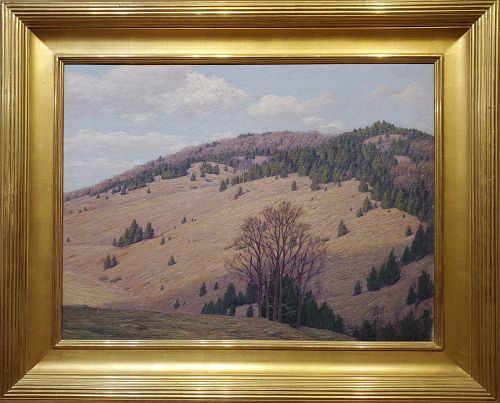 Many of his landscapes are views of New England. He exhibited extensively at the National Academy of Design, Pennsylvania Academy of the Fine Arts in Philadelphia, the Art Institute of Chicago, the Carnegie Institute in Pittsburgh, and other major cities. He was a member of the National Society of Mural Painters, the Salmagundi Club, the Architectural League of New York, Allied Artists of America, American Watercolor Society, the Circolo Artistico of Rome, Italy, and the Union International Des Beaux Arts et Des Lettres of Paris, France. A memorial show of Schwartz’s work was held at the Lotus Club of New York City in 1944 through the efforts of the sculptor, Charles Keck. The dean of art critics of the time, Royal Cortissoz, viewed Schwartz’s work before the exhibition in Keck’s studio and wrote, "Schwartz could saturate an Italian scene in the handsome ‘Roman Twilight’ but when he came to paint the countryside of his native land he was moved solely by its racy sentiment. He had charm as well as craftsmanship." Perhaps the best tribute one artist can give another was given Schwartz by the famed American artist, Elihu Vedder. After Vedders’s death a number of Schwartz paintings were found in Vedder’s studio. These had been purchased from Schwartz during Vedder’s lifetime.